Amethyst is a violet variety of quartz often used in jewelry. The name comes from the Ancient Greek ἀ a- ("not") and μέθυστος methustos ("intoxicated"), a reference to the belief that the stone protected its owner from drunkenness; the ancient Greeks and Romans wore amethyst and made drinking vessels of it in the belief that it would prevent intoxication. Amethyst is the traditional birthstone for February. Amethyst is the purple variety of quartz (SiO2), containing an impurity of iron, which gives the violet color to the mineral. Amethyst occurs in primary hues from a light pinkish violet to a deep purple. Amethyst may exhibit one or both secondary hues, red and blue. The ideal grade is called "Deep Siberian" and has a primary purple hue of around 75–80%, 15–20% blue and (depending on the light source) red secondary hues. Green quartz is sometimes incorrectly called green amethyst, which is an actual misnomer and not an acceptable name for the material, the proper terminology being prasiolite. It is actually against FTC Guidelines to call prasiolite green amethyst. Other names for green quartz are vermarine, greened amethyst, or lime citrine. Of very variable intensity, the color of amethyst is often laid out in stripes parallel to the final faces of the crystal. One aspect in the art of lapidary involves the correct cutting to place the color correctly in order to make the tone of the cut stones homogeneous. The Greeks believed amethyst gems could prevent intoxication, while medieval European soldiers wore amethyst amulets as protection in battle – the reason for this being that amethysts are believed to heal people and keep them cool-headed. Beads of amethyst were found in Anglo-Saxon graves in England. A large geode, or "amethyst-grotto", from near Santa Cruz in southern Brazil was presented at the 1902 exhibition in Düsseldorf, Germany. In the 19th century, the color of amethyst was attributed to the presence of manganese. Synthetic amethyst is thus man-made by gamma-ray, x-ray or electron beam irradiation of clear quartz which has been first doped with ferric impurities. On exposure to heat, the irradiation effects can be partially cancelled and amethyst generally becomes yellow or even green, and much of the citrine, cairngorm, or yellow quartz of jewelry is said to be merely "burnt amethyst". Synthetic amethyst is made to imitate the best quality amethyst. There is one test based on "Brazil law twinning" (a form of quartz twinning where right and left hand quartz structures are combined in a single crystal) which can be used to identify synthetic amethyst rather easily. In Greek mythology, Dionysus, the god of intoxication, and of wine, was pursuing a maiden named Amethystos, who refused his affections. Amethystos prayed to the gods to remain chaste, a prayer which the goddess Artemis answered, transforming her into a white stone. Humbled by Amethystos's desire to remain chaste, Dionysus poured wine over the stone as an offering, dyeing the crystals purple. The mortal turned out to be a beautiful young woman, Amethystos, who was on her way to pay tribute to Artemis. Dionysus wept tears of wine in remorse for his action at the sight of the beautiful statue. The god's tears then stained the quartz purple. Another variation involves the titan Rhea presenting Dionysus with the amethyst stone to preserve the wine-drinker's sanity. The largest opencast amethyst vein in the world is in Maissau, Lower Austria. 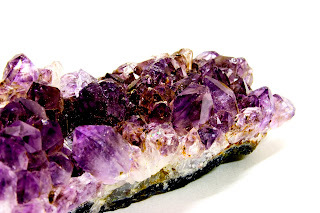 Many localities in south India yield amethyst. One of the largest global amethyst producers is Zambia in southern Africa with an annual production of about 1000 tonnes. Amethyst occurs at many localities in the United States. Among these may be mentioned: the Mazatzal Mountain region in Gila and Maricopa Counties, Arizona; Red Feather Lakes, near Ft Collins, Colorado; Amethyst Mountain, Texas; Yellowstone National Park; Delaware County, Pennsylvania; Haywood County, North Carolina; Deer Hill and Stow, Maine and in the Lake Superior region of Minnesota, Wisconsin, Michigan, and Ontario in Canada. Amethyst is relatively common in Ontario, and in various locations throughout Nova Scotia. The largest amethyst mine in North America is located in Thunder Bay, Ontario. Up until the 18th century, amethyst was included in the cardinal, or most valuable, gemstones (along with diamond, sapphire, ruby, and emerald). Collectors look for depth of color, possibly with red flashes if cut conventionally.The highest grade amethyst (called "Deep Russian") is exceptionally rare and therefore, when one is found, its value is dependent on the demand of collectors. It is, however, still orders of magnitude lower than the highest grade sapphires or rubies (padparadscha sapphire or "pigeon's blood" ruby).